Apologies for being so slack lately. I have had an attack of domestic 20/20 vision…and what I saw was not pretty. I have people coming over for Christmas Eve dinner, and suddenly the dirty windows, clutter, dust, muddy paw prints, dust bunnies etc etc etc. sent me into a panic of cleaning. Sadly, the more I do, the more mess I see. With the clock ticking, I’ve had no energy left over for writing. Anyway, I thought you might like to see some pics I took from the outside. 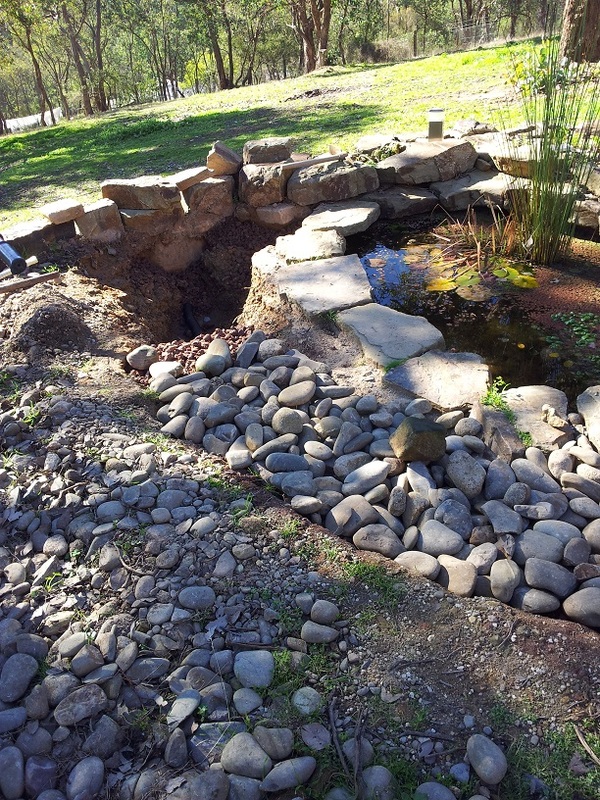 This is a drain I dug around my big[ger] fish pond to stop sediment washing in during heavy rains. This is the same drain half filled in. Down the bottom of the drain is a flexible, black plastic agricultural pipe [aggi pipe in the local parlance]. It connects to a drainage layer protecting the retaining wall at the top of the pic. On top of the pipe is a thick layer of scoria, and on top of that are the beautiful river pebbles. 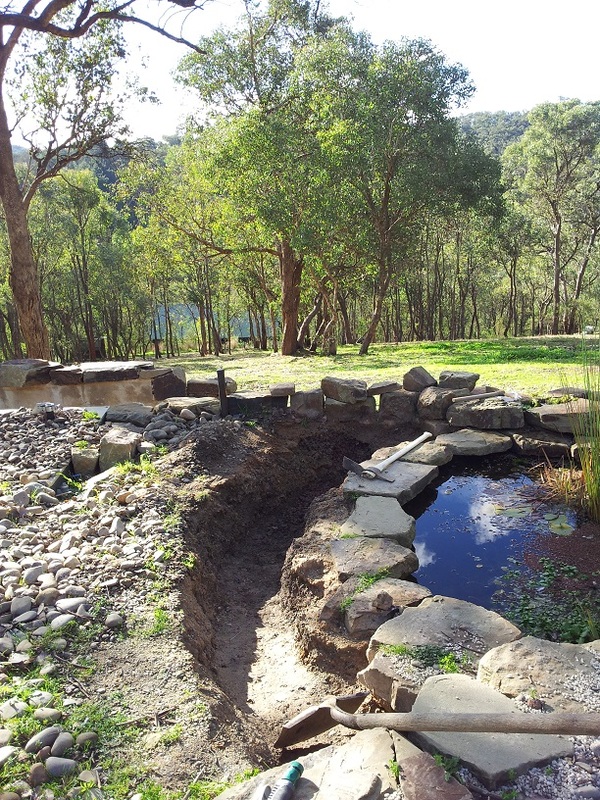 The two ponds featuring in the previous pic are tucked in behind the retaining wall you can see in the fore front. One of the alpacas decided to get in on the photo shoot. Behind, and to the left of the alpaca is a section of the Clark pool that isn’t hidden by the pool fence. The small, bright blue thingie hard up against the house is my greywater tank. Water from the laundry and the shower is plumbed into the tank. 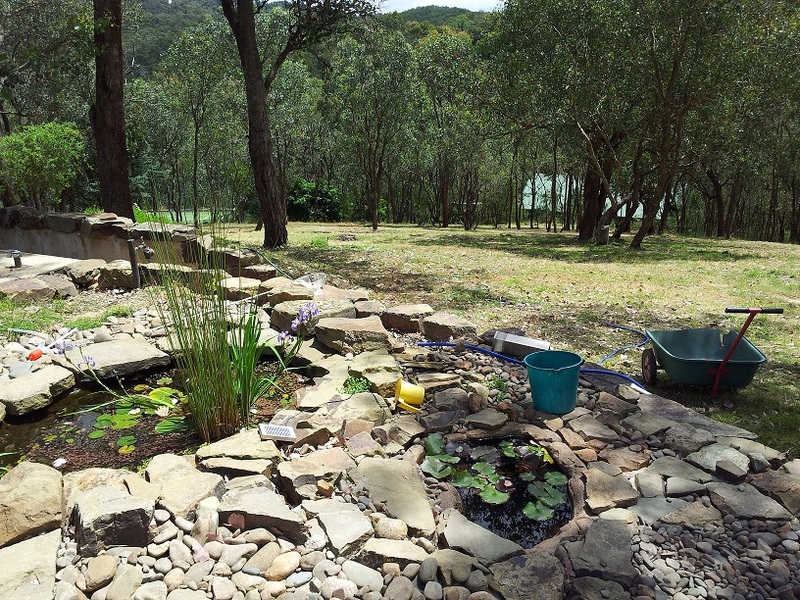 The greywater usually flows straight through to the terraced area in the middle of the picture. During high fire danger days I close the tap off so the greywater fills the tank and becomes another source of firefighting water. This is my, um… wine cellar. 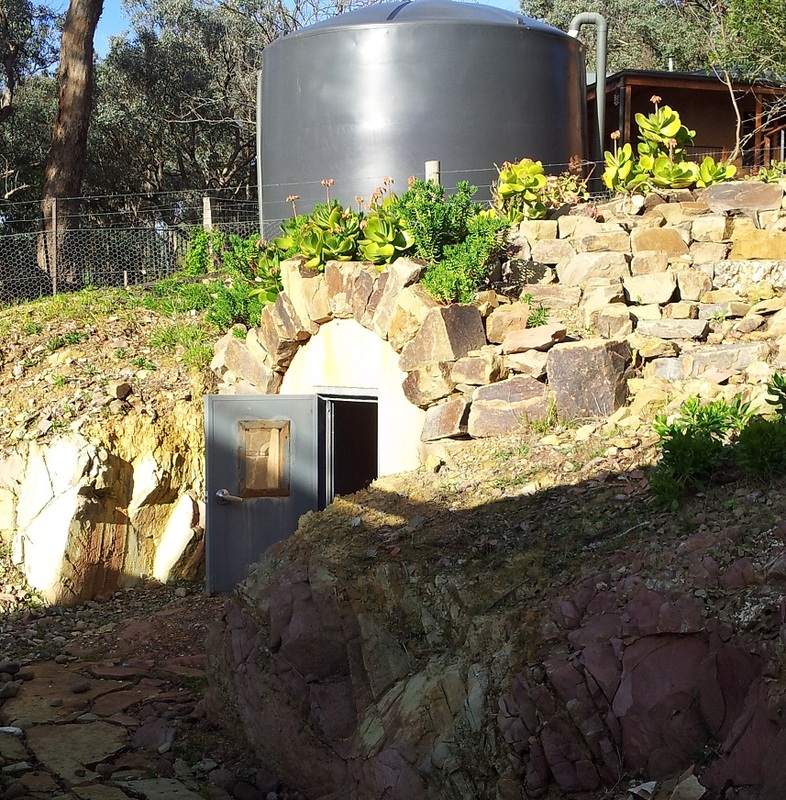 -cough- It looks a bit like an igloo and the whole structure is buried into the hillside. 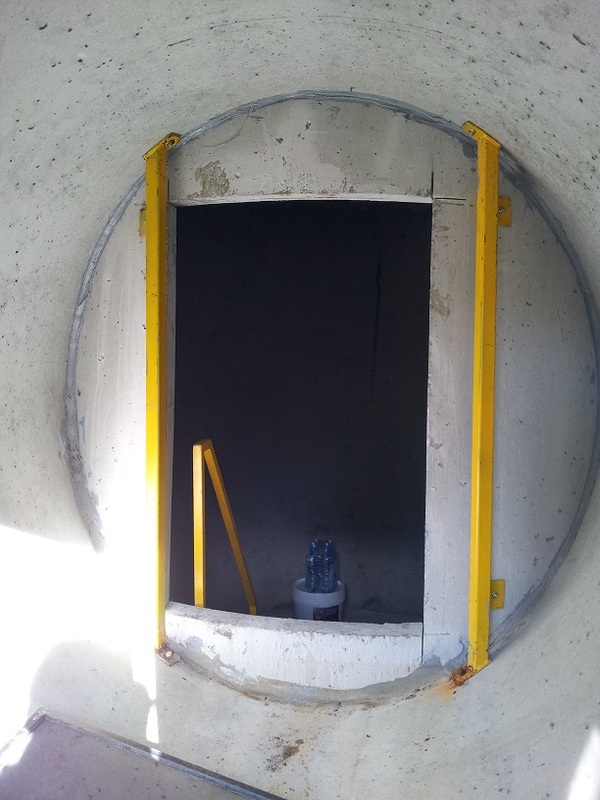 This is an inside shot of the wine cellar showing the inner doorway and the yellow ladder leading down [about 1/2 a metre] into the main area. Last but not least, this is a shot of the cellar with its protective covering of soil and rocks. The plants directly around the cellar are all succulents. The black plastic water tank in the background belongs to my neighbour. 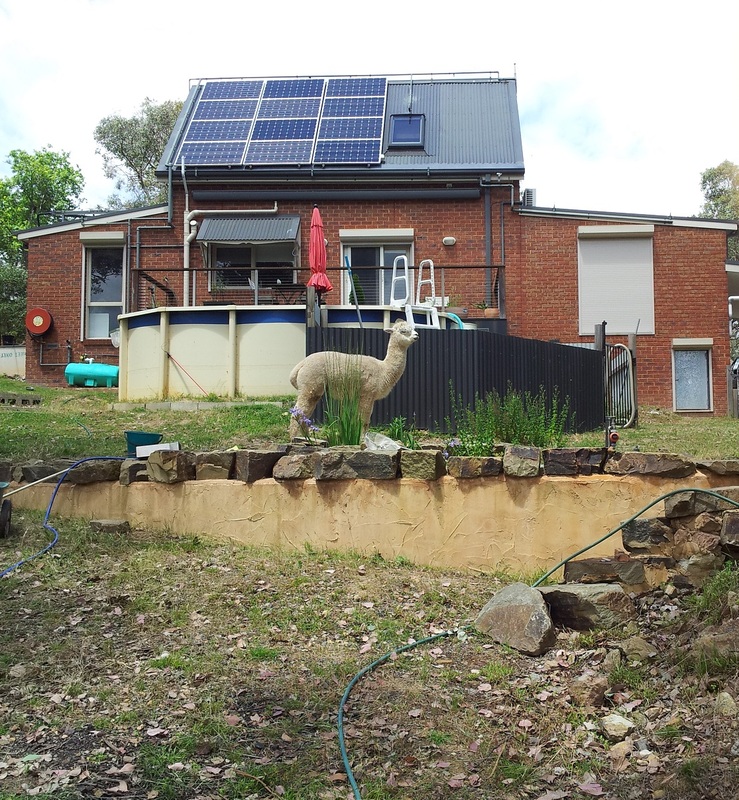 This entry was posted on Wednesday, December 18th, 2013 at 3:07 pm	and tagged with alpaca, Clark-pool, drainage-channel, greywater-tank, pics, ponds, Warrandyte, wine-cellar and posted in Uncategorized. You can follow any responses to this entry through the RSS 2.0 feed. Meh…I’d rather have your kind of dungeon/castle! Mine is quite small and pokey. I envisage something labyrinthine with guttering torches, rats and moss. Can I come visit when you get one? Thanks for a tour of the property! Your yard is gorgeous. Someday I will have a dream yard too. Right now mine is covered in snow and fog has been hanging in the air for three days. Great pics, AC. What a beautiful place you have 🙂 And as for housework, ugh. I think most writers can feel your pain…I’ve practically forgotten what a dust pan looks like. Since I found I couldn’t stand to see the mess in some rooms I thought it best just not to go in them any more. That didn’t work so I’ve cleared a path through them and now wear blinkers as I pass through them. Your place looks fantastic, especially Bilbo’s house of fun and bottles. I like the alpaca who decided to get in on the act too, why not! I hope your Christmas eve gathering goes well, my invitation seems to be lost in the pot. Dust is a protective coating. That’s how I see it. 🙂 Happy Holidays! Domestic 20/20 vision… sounds awful, I hope it never happens to me. However despite the tediousness of domestic goddess duties it’s an enjoyable feeling when it’s done, and you can start 2014 afresh. Your efforts outside look amazing. Your surroundings are beautiful and I’m impressed by the seriousness of the mattock and shovel. 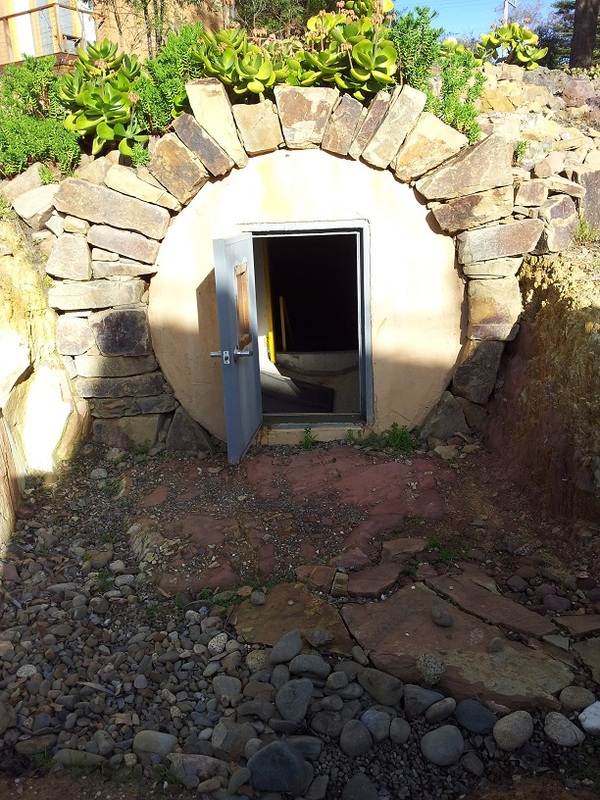 The wine cellar looks like a Hobbit hole. Perhaps Peter Jackson could use your property for location shots. I’m sure there’s be a role for the camera hogging alpaca also. The first thing I did after reading this post was to search the page for “hobbit” to see if anyone beat me to that observation…and sure enough someone did! If you’re a lazy blogger, I don’t even want to think what that makes me. lmao – yes, you weren’t the first, but I’m tinkled pink you saw the resemblance too. The effect was deliberate. I wanted the um, cellar to be attractive as well as functional. No wild dingoes anywhere around here, or koalas, but we’ve had a couple of kangaroos pass through, plus a wallaby [smaller cousin to the kangaroo], an echidna [like a porcupine], and just the other day I found a small tortoise mooching along the fenceline! It’s a weird spot that literally straddles the divide between country and urban. -grin- Lazy is relative. For almost two years I’ve tried to post 2 – 3 articles a week. Now I’m down to barely one. But hey, it is the silly season, right? Lovely ponds there, good work! I’m sure the frogs and birds love you. I bet you’re glad it is done before the 40deg day we are having tomorrow too. Bleh…..